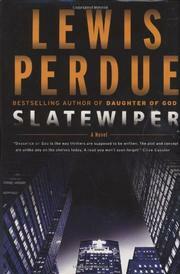 Perdue (Daughter of God, 2000, etc. ), a former investigative reporter who specialized in recovery of art missing in Europe, turns to bio-ethics and DNA analysis. Molecular geneticist Lara Blackwood, cofounder and CEO of GenIntron, a bioengineering lab, is an entrepreneur who develops new disease treatments with synthetic genes made from junk DNA in the human genome. When Tokyo is hit hard by a supermysterious, fast-acting “Korean disease” universally fatal to its victims, Lara, fired from GenIntron by its new parent company in Japan, Daiwan Ichiban, is taken on by the White House as presidential aide in genetic development. As it happens, not a single Japanese, only the detested Koreans in Tokyo’s Korean ghetto, die of the Korean Leprosy in the test run of an ethnic bioweapon that focuses the disease on people bearing Korean genes. The Slatewiper, whose synthetic gene reduces people to slime and then into a bloodburst, is the weapon by which Daiwan Ichiban’s top gun Tokutaru Kurata means to purify Japan of foreigners and boost fervent nationalism. The Saudis want GenIntron to formulate a bug that will kill all Jews in Israel, while actual production of the materials will be in Japan at Daiwan Ichiban. The president himself, apparently fearful of Tokutaru Kurata, warns Lara off from pursuing the source of the Korean Leprosy. But Lara has won two Olympic medals and begun a solo round-the-world sail, is tall for a woman, a martial-arts adept, and not to be dissuaded by a mere president. Clearly, the day must come when she goes man-to-man with Sheila Gaillard, the bad guys’ hugely vicious and skillful hit woman who murders one by one all of Lara’s scientific helpers as Lara works undercover to unearth a bio-weapon for which she is partly responsible. And not even Sheila having her face splashed with frozen hydrogen can stop her. Rich research for science/action thrills.